Dallas, TX, October 25, 2011 --(PR.com)-- On Saturday, October 22, 2011, representatives from RMCN Credit Services, Inc. participated in McKinney Make a Difference Day by volunteering at Holy Family School. 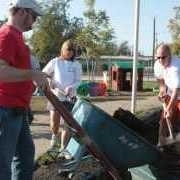 There were over 40 volunteers; many were in the current class of Leadership McKinney or were prior graduates. At 8:00 AM in the morning they set off to improve the school’s playground, landscape, and lay the groundwork for the community garden. Volunteer McKinney Center coordinates each year with hundreds of volunteers throughout the community on the 4th Saturday in October to participate in multiple service projects. McKinney Make a Difference Day is held in conjunction with the National Points of Light event. This year’s event is sponsored by the McKinney Community Development Corporation (MCDC). Leadership McKinney provides training and education for those who either work or live in McKinney. It also promotes volunteering and is sponsored by the McKinney Chamber of Commerce. RMCN has had employees graduate from the program for the past five years and Natasha Ibarra is currently enrolled and is scheduled to graduate in May of 2012. Doug Parker, RMCN’s CEO, is a graduate of the 2007 class and stated “The Leadership Program is a great way to get involved and give back to a community that has done so much for us”. Holy Family School, a mission of the Episcopal Diocese of Dallas, opened its doors in 1950 to provide care for the children of Hispanic migrant workers, while preparing them to enter the public school system. In the 1960’s, the school opened to all children. Today, Holy Family School continues to offer developmental programs to a diverse population of McKinney children. Click here to view the company profile of RMCN Credit Services, Inc.
Click here to view the list of recent Press Releases from RMCN Credit Services, Inc.